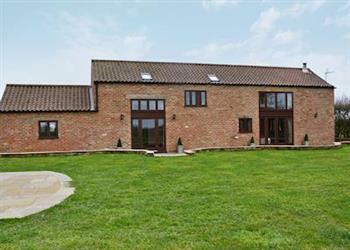 Kyme Barn at Kyme Retreats in North Kyme, near Sleaford sleeps 12 people. The cottages at Kyme Retreats near Sleaford offer spacious accommodation; these superb barn conversions (refs RHHD and RHHE [Kyme View]) nestle in a tranquil rural location. Both barns enjoy a large private garden and a hot tub, with Kyme Barn also benefiting from a completely self-contained cottage annexe with a living room/kitchen, two bedrooms and a bathroom. For those looking for exploration, the area has plenty on offer. Visit the Battle of Britain Memorial Flight Visitor Centre at Coningsby, home to the WWII Lancaster and Spitfire. Sleaford is 8 miles and Lincoln, famous for its cathedral, Magna Carta Centre and vibrant wharf area, is 19 miles. For a day out, travel to Norfolk or Hunstanton with its sandy beach, or for wildlife enthusiasts there are many nature reserves within easy reach. There is an 18-hole golf course with a clubhouse at South Kyme, just 4 miles away. Great walks and cycle routes can be enjoyed throughout the area. The shop, pub and restaurant are all 1½ miles from Kyme Retreats near Sleaford. Large living room with wood-burning stove and wooden floor. Sitting room. Large kitchen/dining room with electric Aga (for cooking), French doors and tiled floor. Utility. Double bedroom with 5ft bed and en-suite shower room with toilet. Shower room with toilet. First floor: Double bedroom with 5ft bed. Two twin bedrooms. Bathroom with over-bath shower and toilet. Annexe: Living room with kitchen area. Double bedroom with 5ft bed. Twin bedroom. Shower room with toilet. Note: Kyme Barn (ref RHHD) can be booked with Kyme View (ref RHHE [Kyme View]) to sleep up to 22 guests. Pets allowed at Kyme Retreats - Kyme Barn. For a better idea of where Kyme Retreats - Kyme Barn is, you can see Kyme Retreats - Kyme Barn on the map below. Kyme Retreats - Kyme Barn is in Lincolnshire; should you be on the lookout for a special offer, you can find all the special offers in Lincolnshire. It's always worth checking to see what is on offer at the moment. Do you want to holiday near Kyme Retreats - Kyme Barn (RHHD), you can see other cottages within 25 miles of Kyme Retreats - Kyme Barn; have a look to find your perfect holiday location.